Ezra Tessler (b. 1980, Philadelphia, PA) lives and works in New York. He completed his MFA in painting from Bard College in 2016 and holds previous degrees from Harvard University and Columbia University. His recent solo and two-person shows include Ezra Tessler and Barb Smith, New Proposals with Páramo at Zsona Maco, Mexico City, 2016; Rafters at Culture Room, Brooklyn, NY, 2014; The Red-Haired Man at Good Weather, North Little Rock, AR, 2013. His recent group shows include Everything Real at Hap Gallery, Portland, OR, 2016; Broadcast from Cedarburg, NJ, Bannerette, Brooklyn, 2016; Shades, The Bedfellows' Club, Little Rock, AR, 2016; and Painters NYC, Museo de los Pintores Oaxaqueños (MUPO), Oaxaca, Mexico, 2016. He has been the recipient of a Jacob Javits Fellowship, a Joan Mitchell Foundation Grant, and a Pforzheimer Foundation Fellowship, among other awards. Caitlin MacBride (b. 1983, Norwich, CT) lives and works in New York. She received her MFA in painting at Bard College and holds a BFA from RISD. MacBride has had solo shows at Chapter NY, Real Fine Arts , and GRIN and appeared in group shows at Greene Naftali, Zach Feuer, and 247365. Her work has been written about in Modern Painters, Art Forum, Dis Magazine, New York Magazine, and Vogue. She has done residencies at the Salzburg Summer Akademy, Lighthouse Works, and Frontispiece Hudson. Lauren Seiden (b.1981, New York, New York) lives and works in New York City. She received her BA in Painting and Drawing from Bennington College, Bennington, VT in 2003. Her recent solo and two person shows include Yesterday So Fast at Denny Gallery, New York, NY, 2016; Untitled at Denny Gallery, Miami Beach, FL, 2014; Lauren Seiden at Mattatuck Museum, Waterbury, CT, 2014; Lauren Seiden: Querencia at Denny Gallery, New York, NY, 2014; Two Person with Camilla Emson at Gallery Nosco, Rio, Brazil, 2013. Her recent group shows include Violet Burning Sunset, Curated by Todd Von Ammon at Usdan Gallery, Bennington, VT 2016; Cubit at New Release Gallery, New York, NY 2016; Raylets at Radical Abacus, Sante Fe, New Mexico, 2016; “Artinternational Istanbul”, Istanbul,Turkey, 2015; “Name it by trying to name it”, The Drawing Center, New York, NY. Mark Starling (b. 1987, Atlanta, GA) lives and works in Brooklyn, NY. He received his BFA from University of Georgia, Lamar Dodd School of Art, Athens, GA in 2011; he received his MFA from Yale University School of Art, New Haven, CT in 2014. 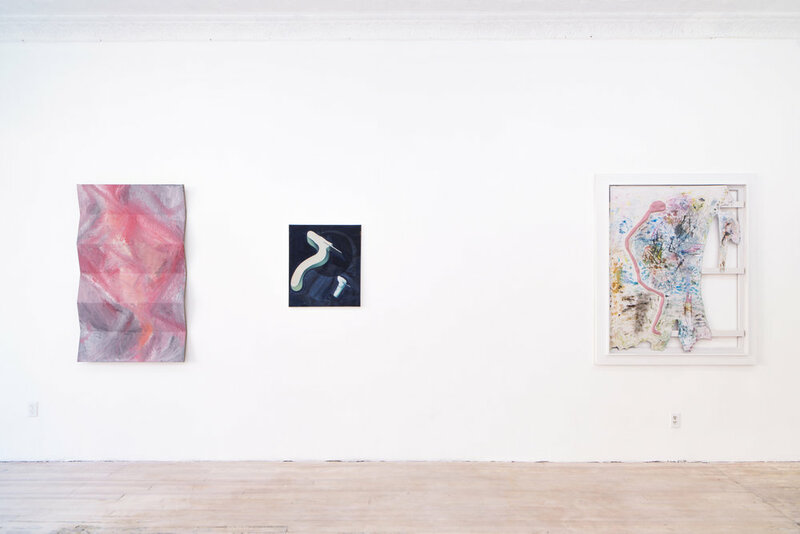 His recent solo and two person shows include In Time at 315 Gallery, New York, NY, 2016; Cheryl Bentley / Mark Starling at Junior Projects, New York, NY, 2015. His Recent group shows include NUTUREart Fall Benefit at Pierogi Gallery, Brooklyn, NY, 2015; The Landscape Changes 30 Times at Anahita Art Gallery, Tehran Iran, 2015; Forced Collaboration II at Artspace, New Haven, CT, 2014; Yale Sculpture 2014 at Storefront Ten Eyck, Brooklyn, NY, 2014; Very Yes at Yale School of Art.